In the late 1990s, NATO supported the efforts of the Kosovo Liberation Army (KLA), an ethnic Albanian militia, to secede from Yugoslavia, which then consisted of Serbia and Montenegro. 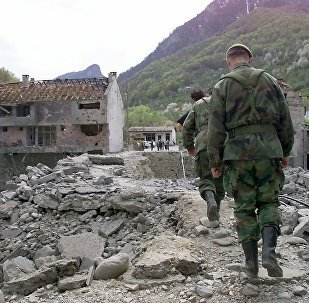 Following violent clashes between the KLA and Serbian troops, US-led NATO forces bombed Yugoslavia in 1999, despite the intervention not having been approved by the UN Security Council. Vladimir Lazarevic commanded the Pristina corps of the Yugoslavian Army. In 2003, he was accused by the International Criminal Tribunal for the Former Yugoslavia of war crimes against Kosovo Albanians during the Kosovo War. Lazarevic spent ten years in jail and was released in 2015.